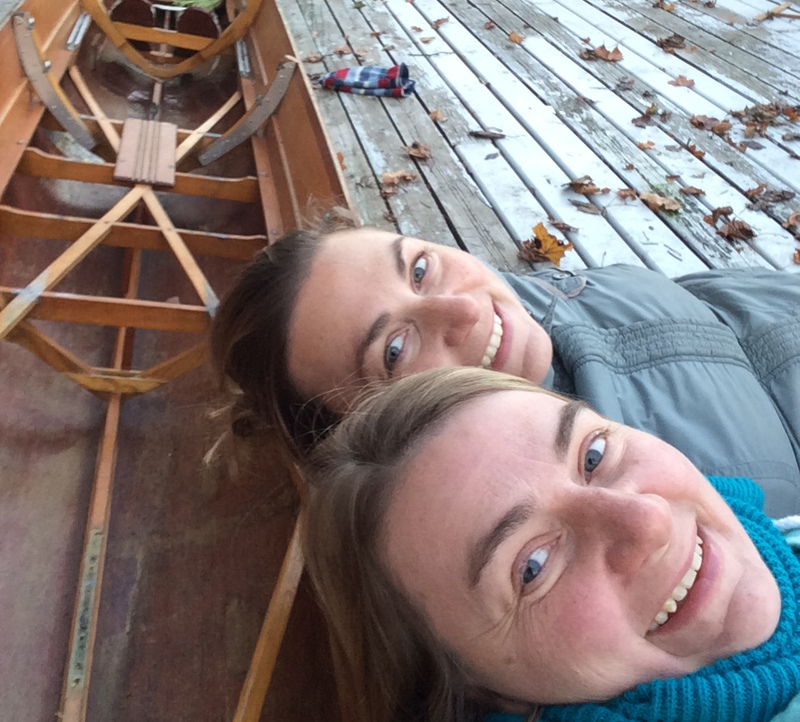 My sister Tracy loves to row and is a rowing coach in Nova Scotia. She was coaching this summer in Lunenburg. 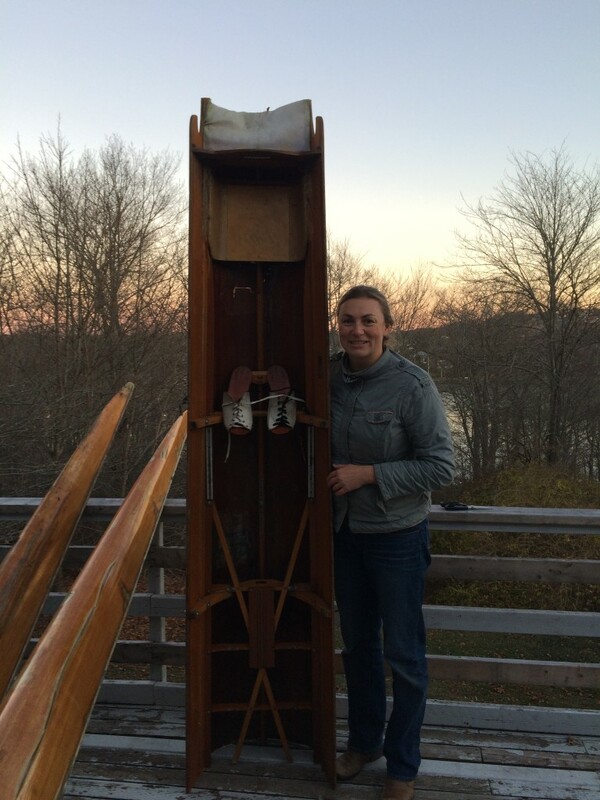 She saw two rowing shells that had been damaged and were left in a field to disintegrate. 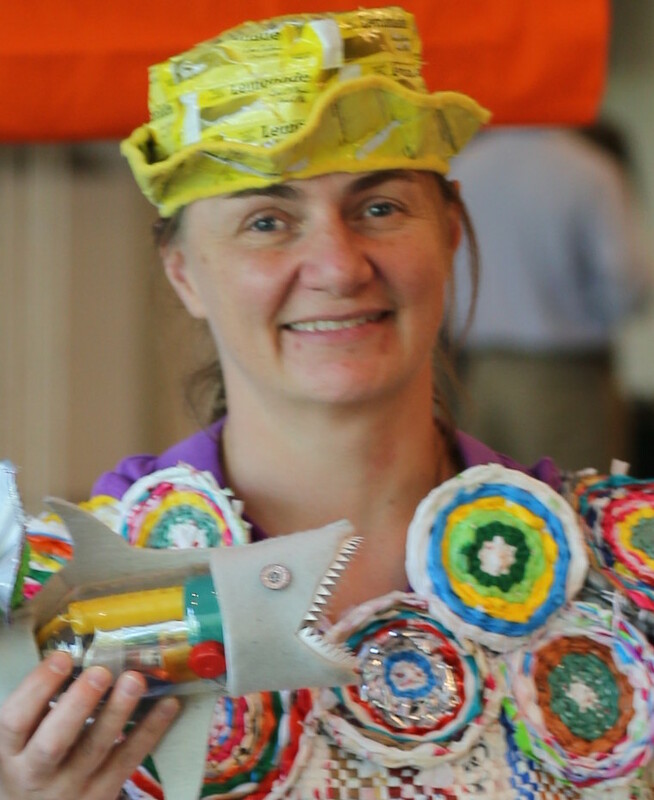 She had an opportunity to bring them home, with the hopes of recycling them into furniture. They were very damaged at the ends, beyond hope for repair. One shell was for a single rower and the other was for four rowers. Their official type was a Kaschper Coxed Four and a Kaschper Single. My sister thinks they were made in Ontario in the 1970’s. Wooden boats by Kaschper were replaced with composite hulls starting in the early 1980’s, so these boats are at least 40 years old. She had been storing the broken shells on her long patio, and wanted to get them inside before it snows. We needed to cut them into lengths short enough to fit into her workroom so she could finish them inside. The ends of the shells were very pointy and too thin to be bookshelves. They were covered with a thin white fabric along the top. We thought perhaps she could make them into lamps. Two ends were damaged beyond hope, but we saved two for that experiment. 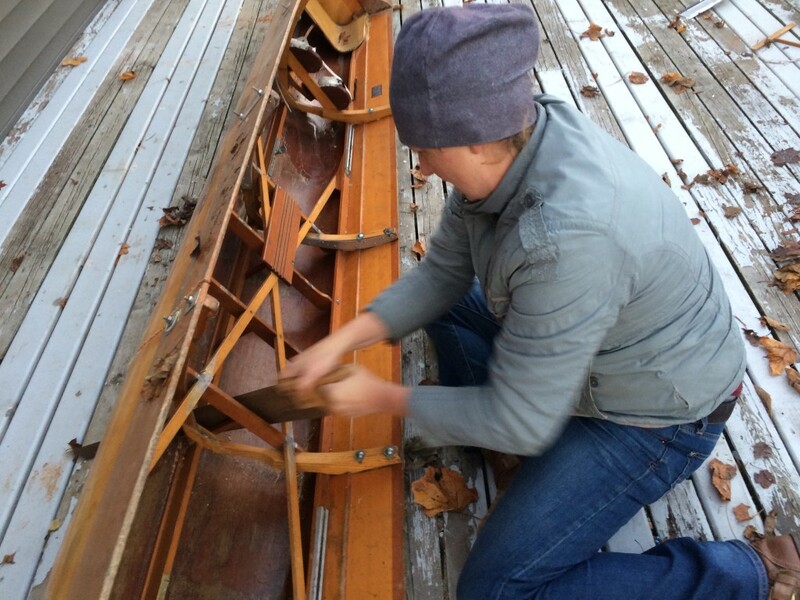 Next we took the single shell and salvaged the part where the rower sits. 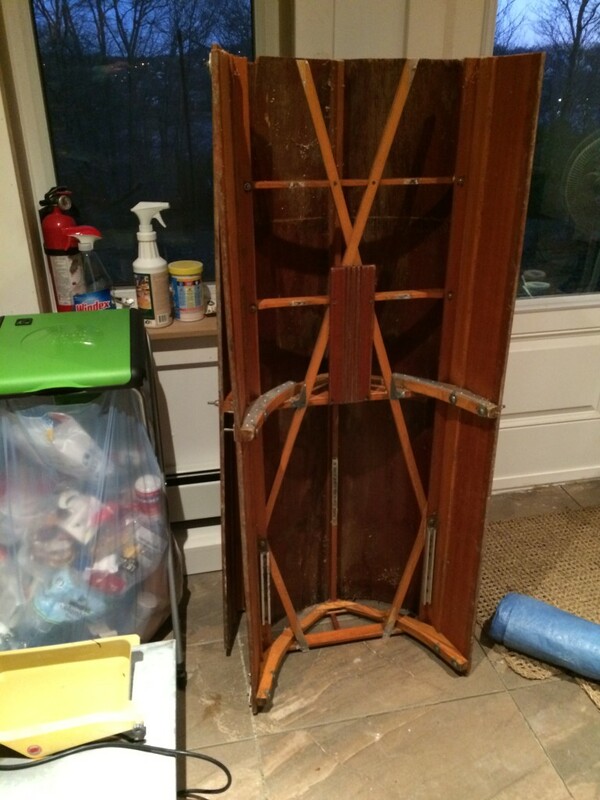 Again, it is likely too small to be a bookshelf – it’s not very deep – but perhaps it could become an art piece for a rowing fan. Lastly we had the body of the four person shell. We wanted to cut it into pieces that could stand vertically in a typical room. We wanted to cut along the ribs to retain structural integrity. You can see in this photo a pair of sneakers in the boat. There were four pairs that were firmly screwed on to foot plates. This is normal for rowing shells. Rowers put their feet into these sneakers, which ensures their feet don’t slip out during a race. We removed those components, but left the foot plates for the coxswain because they still had the original leather uppers from when the boat was first made. There were metal components that were not original and would get in the way for cutting, so we removed them – stopping to take an adorable selfie. It was not difficult to cut through the wood. 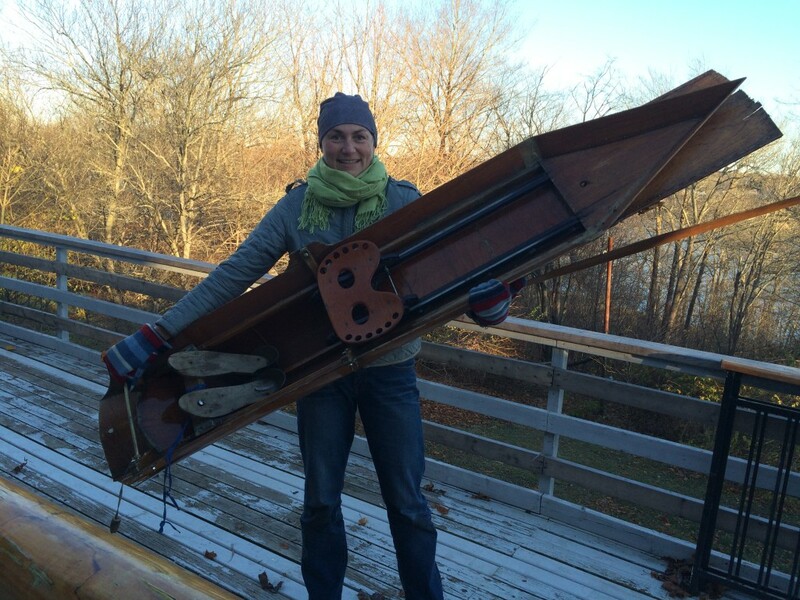 We used a handsaw that might be as old as the boats! My sister’s friend shared research that said many of these boats were made from cedar for the skin and sitka spruce for the frame. These boats are called shells because the skins are so thin – like egg shells. Do you see that rectangular piece of wood near Tracy’s right hand? This is where a rower is allowed to step when getting into the boat, before putting their feet into their sneakers. If they step elsewhere, they can step right through the boat side. Tracy said that when coaching new rowers, this is the most scary part – that they will step in the wrong spot. She tells them stories about getting giant splinters in their leg to help them remember this important detail. The more difficult parts to cut were along the edges (or gunnels) and the keel. Our favorite section was the end where the coxswain sits. For those less familiar with rowing, a coxswain faces towards the rowers. She is the only person facing forward and steers the boat. She also helps the rowers stay in rhythm. 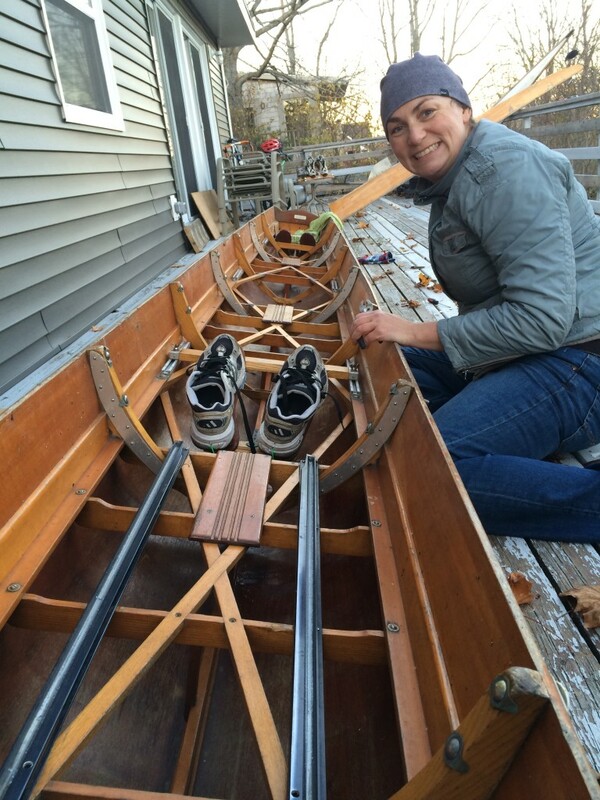 Check out the coxswain’s two leather shoes that are attached to the foot pads. 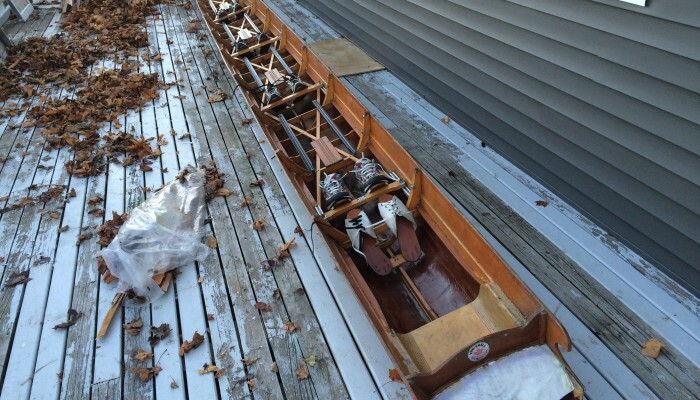 You can also see in the background behind the trees the lake behind my sister’s house where she rows in warmer weather. The two center pieces of the shell, we cut into identical lengths. These are the widest and deepest parts of the shell, and the most likely to be actual bookshelves, and not just art pieces. We think we could cut semi-circles of wood and set them on the ribs to make the shelves. 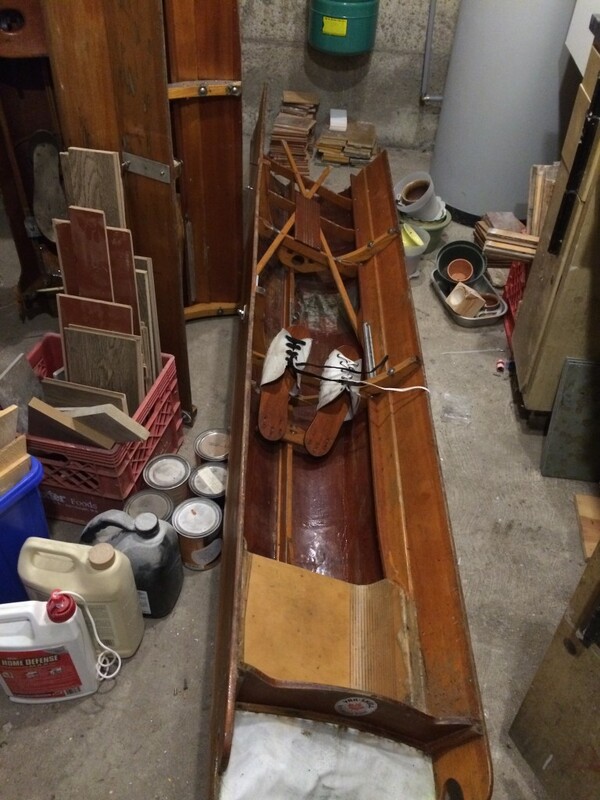 We stored the pieces in Tracy’s workroom, now safe from the winter weather and ready for creativity to transform into one-of-a-kind rowing treasures! 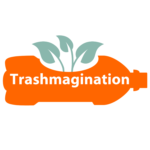 It was fun doing a Trashmagination project outside. How many people can say they recycled a rowing shell? 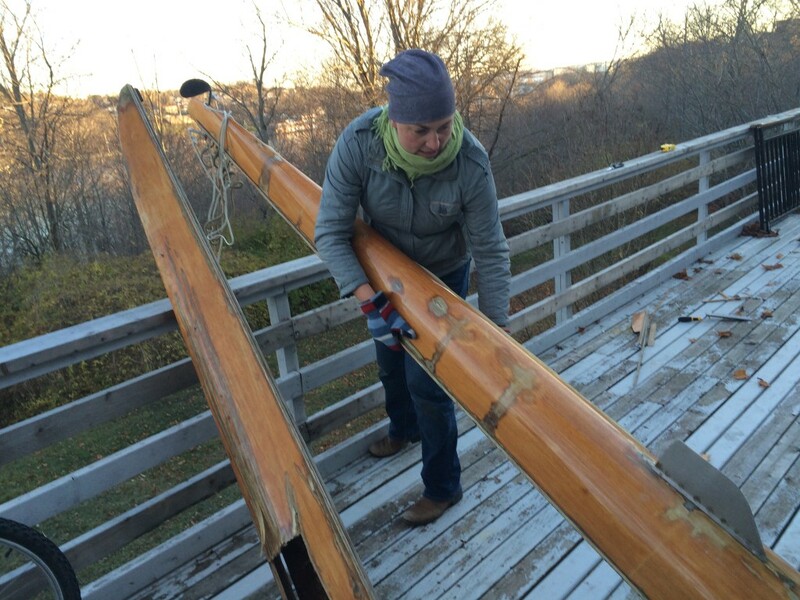 Since these types of boats are not even made from wood anymore, this type of project is a rare life experience.